Use of this excerpt from Running with the Demon by Terry Brooks may be made only for purposes of promoting the book, with no changes, editing or additions whatsoever and must be accompanied by the following copyright notice: copyright ©1997 by Terry Brooks. She emerged finally in the heart of the deep woods in a clearing dominated by a single, monstrous oak. The other trees seemed to shy away from it, their trunks and limbs twisted and bent, grown so in an effort to reach the nourishing light denied them by the big oak's sprawling canopy. The clearing in which the old tree grew was barren of everything but a few small patches of saw grass and weeds. No birds flitted through the oak's ancient branches. No squirrels built their nests within the crook of its limbs. No movement was visible or sound audible from any part of its gloomy heights. All about, the air was heavy and still with heat and shadows. Nest stared upward into the old tree, tracing the line of its limbs to the thick umbrella of leaves that shut away the sky. She had not come here for a long time. She did not like being here now. The tree made her feel small and vulnerable. She was chilled by the knowledge of the dark purpose it served and the monstrous evil it contained. For this was the prison of a maentwrog. Pick had told her the maentwrog's story shortly after their first meeting. She remembered the aged tree from her flight into the park atop Daniel. She had seen it in the hazy gloom of the deepening twilight, and she had marked it well. Even at six, she knew when something was dangerous. Pick confirmed her suspicions. Maentwrogs were, to use the sylvan's own words, "half predator, half raver, and all bad." Thousands of years ago they had preyed upon forest creatures and humans alike, devouring members of both species in sudden, cataclysmic, frenzied bursts triggered by a need that only they understood. They would tear the souls out of their victims while they still lived, leaving them hollow and consumed by madness. They fed in the manner of the feeders, but did not rely on dark emotions for their response. They were thinking creatures. They were hunters. This one had been imprisoned in the tree a thousand years ago, locked away by Indian magic when it became so destructive that it could no longer be tolerated. Now and again, it threatened to escape, but the magic of the park's warders, human and sylvan, had always been strong enough to contain it. Until now, Nest thought in horror, realizing why Pick had brought her here. The massive trunk of the ancient oak was split wide in three places, the bark fissured so that the wood beneath was exposed in dark, ragged cuts that oozed a foul, greenish sap. "It's breaking free," the sylvan said quietly. Nest stared wordlessly at the jagged rifts in the old tree's skin, unable to look away. 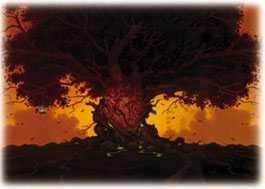 The ground about the oak was dry and cracked, and there were roots exposed, the wood mottled and diseased. "Why is this happening?" she asked in a whisper. Pick shrugged. "Something is attacking the magic. Maybe the shift in the balance of things has weakened it. Maybe the feeders have changed their diet. I don't know. I only know we have to find a way to stop it." "Maybe. The fissures are recent. But the damage is far more extensive than I have ever seen before." He shook his head, then glanced left and right into the trees about them. "The feeders sense it. Look at them." Nest followed his gaze. Feeders lurked everywhere in the shadows, hanging back in the gloom so that only their eyes were visible. There was an unmistakable eagerness in their gaze and in their furtive movements, an expectancy that was unsettling. "What happens if the maentwrog breaks free?" she asked Pick softly, shivering with the feel of those eyes watching. Pick cocked an eyebrow and frowned. "I don't know. It's been a prisoner of the tree for so long that I don't think anyone knows. I also don't think anyone wants to find out."